The furnishing of Christmas Party looks so very festive and nice! The dining area is so very nice! The green colour and the type of seating looks very nice. The wall of bookcases gives a great look to the room. Very nice music nook in the room! Sims will enjoy listening to music from the piano being played whilst sitting at the table enjoying eating a meal. The red flowers on the top of the piano are pretty for sims to see when playing the piano. Very nice bar counter alcove area! Sims will enjoy sitting on the stools having a drink from the bar after their meal. The cabinets, keg, bottles, drink bucket and drinks display shelves look very nice there! The garlands, wreath and snowflakes patterns are nice festive touches on the walls. The wall pattern looks nice and the golden colour of the Christmas tree looks very pretty with it. The presents look great there near the tree! Very nice fireplace red sofa and armchair sitting area! The grandfather clock there looks homely. Sims will enjoy sitting resting there in front of the fire. The teaset on the coffee table, the family photos on the wall and the trains on the fireplace ledge are nice home touches there. Sims will enjoy listening to music through the wall stereo, The patterned floor rugs add to the very nice look of the room. The little white tree is a nice touch on the dining table. Sims will enjoy eating and drinking food and drinks from the banquet table and fountain. The room is festively nice! 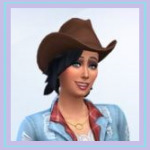 Congratulations on your sims winning the sims challenge! The layout and furnishing of West End Loft is very nice! The kitchen, dining and bar area is very nice! Sims will enjoy sitting at the dining table eating meals that they have cooked on the stove, and enjoy having a drink from the bar with their meal. The drinks display shelves look great on the bar wall. The menu board, wall cutlery, fruit bowl and mugs set are nice kitchen touches there. Very nice study /office alcove! It looks great how the study desk table is angled there. Sims will enjoy sitting at the desk table using the computer or reading a book from the bookcase. The filing cabinets, files and noticeboard look great there! Sims will enjoy keeping fit using the treadmill and have fun playing chess. It looks very nice how the room areas are divided off. The bed area looks very nice! Very creatively designed clothes closet! The open doors on the closet look great! Nice sofa seat sitting area in the bedroom. The bathroom is very nice. It is nice that the triangular bathtub is used in the room. The blue circular floor rug there adds a nice look to the room. The room and the sim are very nice! Underwater Bedroom looks so very nice! Congratulations on winning the room challenge! Very nice furnishing of the room! The alien plants through the room look very nice! Very nice bathroom area! The wall and floor tiling looks very nice. It is nice that there is the triangular bath tub in the room. The towels and toiletries are a nice touch on the sink counter and wall. The turtles look great on the bathroom floor! Very nice bed area of the room! The curtains looks very nice on the bedhead wall and the webs either sides of them look great! The fish bowl and ship are nice oceanic touches on the bedside table. The fish tanks suit the underwater theme so very well! Sims will enjoy looking at the restful sight of the fish whilst in their bedroom. The seahorse looks very great! The candlelights look pretty in the room, and very nice type of windows that you have used. It is great that there is an underwater treasure chest in the room! The top hat statues are nice touches in the room. Neptune King is very nice! Very nice outfits that he is wearing the different clothing categories. Fairytale Bedroom is very pretty! The castle-type texture of the walls looks nice. Very nice furnishing of the areas of the room! The bed area is very nice! The pink colour of the bed is pretty and the curtains look very nice on the bedhead wall over the bed. The hearts look pretty on the bedhead wall! The clock is a nice home touch on the bedside table. The screenshade looks nice separating off the dressing area. The shoes look great there. Sims will have fun playing the llama tabletop game in the room! The nook area where the toy animals are looks so nice! The dinosaur, bunny, heart teddy and deer look very cute there! The circle of dolls talking to each other is very nice! The knight standing guard looks great! Sims will enjoy reading books from the bookcase there. Nice art nook for the sims to enjoy doing artwork on the art table. The nook alcove with many toys and other items on the shelves looks very nice! The cabinets look very nice how they are placed there to create the nook. The animal pictures on the walls of the room look cute! The pink floor rugs in the room look very pretty and add nice touches in the room areas. It is a very nice fairytale bedroom! Mr Hyde's Experiment Room looks great! Very nice furnishing of the room. The scientific jars, crystals, insects display cases and potions look great on the shelves and the mysim figurine looks great on the table. Nice study desk nook for sims to enjoy sitting at the desk table using the computer. The noticeboard looks great on the wall. The inventor science machine and other science equipment look great in the room! The tools wall shelf looks great in the room. Very nice bed area. The blue and brown wall paneling looks nice. The books, clock and files look great in the room. The potions look great on the bedside table! It is a great experiment room! The simversions of Dr. Jeckyll and Mr Hyde are very nice ! It looks great that Mr. Hyde has a green skintone. The brown colour scheme of his clothing looks nice with the green colour of his skin. Antique Victorian is a very nice furniture store! The window displays are very nice! The floral wall pattern in the first window display looks very pretty! The dining room theme of the display looks nice. The plates wall decor are nice dining touches placed either sides of the yellow flowers picture. The type of wall lights suits the antique theme of the room. The flowers look pretty on the dining table and the teaset and crockery display cabinets are homely dining items there, The girls bedroom theme of the other windiw display looks pretty! The flowers wall pattern looks very nice. The bunny, doll and giraffe look cute! The pink and purple colour schrme of the display looks very nice. The purple curtains look very nice around the bedhead and the butteflies look pretty on the wall. The floral screen shade and the flowers look very nice. Very nice furnishing and layout of the rest of the store room! The wall paneling looks nice. The rope barriers look nice how they are used in the room. The animal pictures on the kids bedroom furniture area and the dolls there look cute! The room is very nice! Hugo and Emma are very nice! They will enjoy shopping at your store. Primary Classroom is very nice! Congratulations on winning the challenge! The furnishing of each the areas of the room looks very nice! The yellow colours of the walls looks very sunny! Very nice art alcove! It looks nice how the activity tables are placed along the wall there. The kids will enjoy doing artwork there. The picture and painting on the wall are nice touches there, and the sparkes look pretty on the floor! Very nice study desk area! The different colours of the desks and chairs gives a nice look to the room. The blackboard area is great! The rosette awards are a nice touch on the side of the blackboard. The fishbowls are nice on the side wall table for the kids to enjoy looking at the fish. Very nice computer study desk area for the teacher .She will enjoy using the computer there. The jigsaw patterned flooring looks colourfully nice! The wall clocks are nice touches on the classroom walls. Very nice play area in the room. Kids will have fun playing with the toys from the toy box , playing the llama table top game or with the dollhouse. The bunnies wall prints and the dinosaur wall pattern look great in the area. The coloured shelves look nice on the wall. The reading area is very nice. Sims will enjoy sitting resting on the colourful seats reading books from the bookcase. The classroom is very nice! Oasis Springs Bungalow is very nice! Very nice exterior of the home! The roofing and front porch is very nice! The flowers look very pretty on the front edges of the home,and the water fountain is a nice touch in the front garden. The flowers look nice around the birdbath and the plants are nice touches on the front porch.The bird is nice beside the fromt door. Nice art nook for sims to enjoy painting on the easel in the sunshine. The outdoors dining alcove is very nice! Sims will enjoy sitting at the dining table there eating meals that they have cooked on the BBQ. The floor paving looks great, and it is nice that there is a cooler there. Very nice glas rooted garden area for sims to enjoy growing and harvesting plants, Very nice furnishing of the interior of the home! The kitchen is very nice! The tiled walls and the flower curtains look great! The wall clock, dish rack , pears picture and hanging cutlery are nice kitchen touches there. Nice eat in dining area. The sunflowers look sunny there for sims to see when dining. Very nice layout of the living and bar room! The sofas look nice how they are placed there. The crockery cabinets look great placed either sides of the tv to create a tvs nook! Sims will enjoy sitting resting on the sofas there watching tv and having a drink from the bar. The flowers look pretty on the tv wall table. Very nice furnishing of the bedrooms! Nice study desk nooks in the kids rooms for the sims to use the computer or do homework. The floral wall pattern in tthe girls bedroom looks pretty! The animal wall pictures and the doll look cute and nice! Dreamiest Honeymoon suite is very nice! Congratulations on winning the room challenge! The lighting in the room gives a very nice look and dreamy feel to the room. Very nice entrance area in the room! The roses and sparkles look very pretty in the foyer nook floor and the floral wall pattern looks nice. The balloons are a nice touch on the walls. The floral wedding arch looks very nice in the room. Very nice hot tub alcove! The red walls of candles look very pretty on the edges of the hot tub. The bed area of the room is very nice. The curtains look very nice draped over the picture on the bedhead wall, and the type of curtains on the side wall looks very elegant . The roses are pretty on the bedside tables. The heart teddy looks cute in the room! The fruit bowl and drinks bucket are nice touches on the side table. Very nice tv alcove! The cabinets look very nice how they are placed there around the tv to create the nook. Sims will enjoy sitting there watching tv and having a drink from the drink tray. The candles look very pretty there. The chequered flooring looks very nice. The bathroom area of the room looks very nice! The bathroom wall and floor tiling give a very nice look to the room. The candles and flowers on the bathroom sink are nice for sims to see when using the sink. It is great that there is a massage table and chair in the room. Sims will enjoy sitting at the dining table eating and drinking food and drinks from the banquet table and fountain. The sims are very nice! Lily and Rose Kitchen is very nice! Congratulations on wining the challenge! Very nice layout and furnishing of the room! The green, white and brown colour scheme of the room looks calming and nature themed. The stone textured pillars look very nice in the room. The curved stove, study desk and bar stool counter looks great! Sims will enjoy sitting on the stool using the computer there. The kitchen windows sink nook looks nice! Sims will enjoy the sunlight coming in onto them whilst washing the dishes there. The condiments, wall plates, dishrack cookbooks and bottles are great kitchen touches in the room on the counters, wall and dining table. Very nice dining area for Sims to enjoy eating meals at the table that they have cooked on the grill, and at the same time be looking at their plants that are growing in the planters. Sims will have fun playing chess in the room. The water fountain is nice for sims to see whilst cooking, dining and playing games in the room. The flowers are pretty on the edges of the fountain. Very nice bar counter area for sims to enjoy sitting on the stools having a drink after cooking or eating their meal. The keg and bottles look great on the counter! Sims will enjoy listeming to music through the wall speakers . It is a very nice room! The McDonald sisters are pretty!